The demands of counterterrorism measures and other external dangers have increased significantly in all areas of public life. This also applies to safety at symbolic locations; political demonstrations; major events such as sporting events, concerts and church gatherings; and the transport infrastructure. With the increasing demands on security in public spaces, the costs incurred by society for the sovereign task of averting danger are also rising. 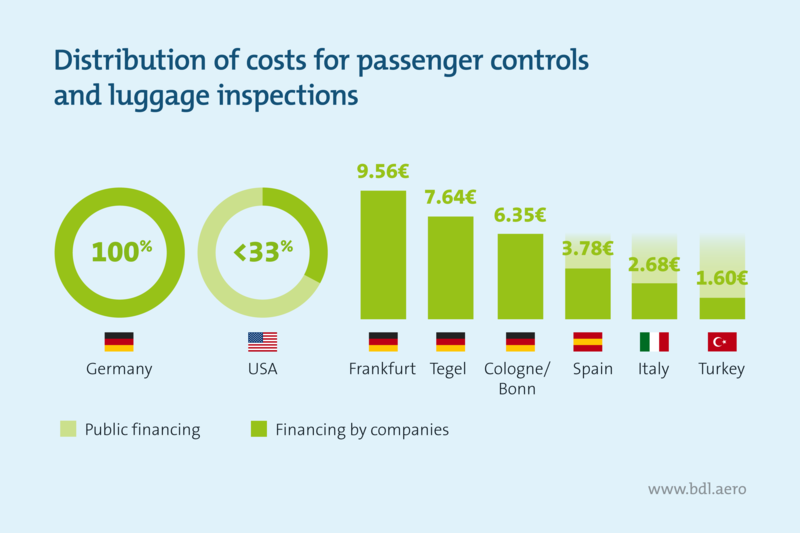 By financing passenger controls and luggage inspections through the companies themselves, the German legislature has chosen an exceptional option – in other areas of public life and in important competitive countries, this is handled differently. Who bears the costs of security checks for air traffic? In 2018, airlines in Germany were charged more than €700 million for controls and luggage inspections. On average, this is more than €7 per departing passenger. Trend: Rising. On top of this are additional expenses for the self-protection of airports and airlines – an amount in the three-digit million range. This special approach to financing passenger controls and luggage inspections cannot be justified, because airport security checks not only protect passengers and employees but also ensure public security. 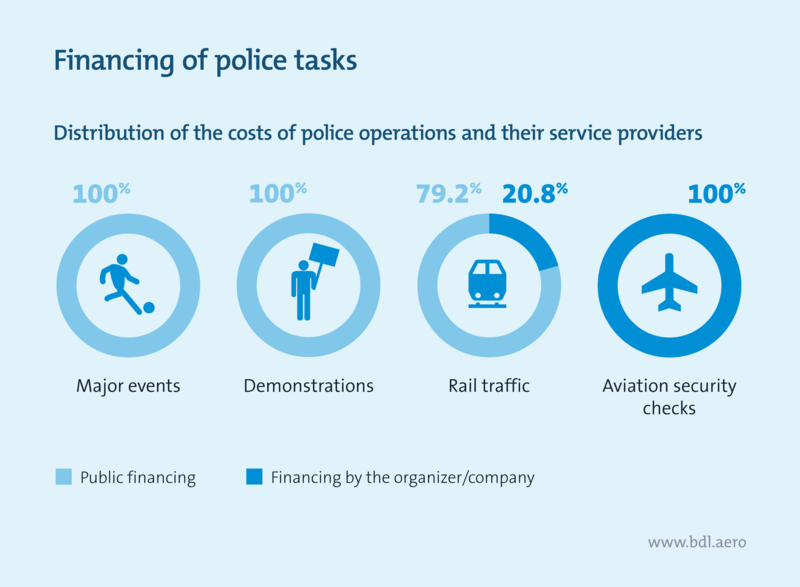 In other areas of society, the costs of police operations are borne by the state: the costs of police operations to secure football matches, concerts and political demonstrations are covered solely by the German state. In rail traffic, the state also carries most of the costs: for operations by the Federal Police and for the security service providers commissioned by them, the legislature has limited the cost proportion for the rail companies to a maximum of 20.8 percent by statutory order (currently, however, due to the unclear legal situation, the railway is not charged anything at all). This unusual German approach to aviation security costs puts German airlines at a disadvantage, as they do most of their business departing from German airports. Foreign airlines are only affected to a lesser extent, as only a minimal part of their business is subject to these regulations. 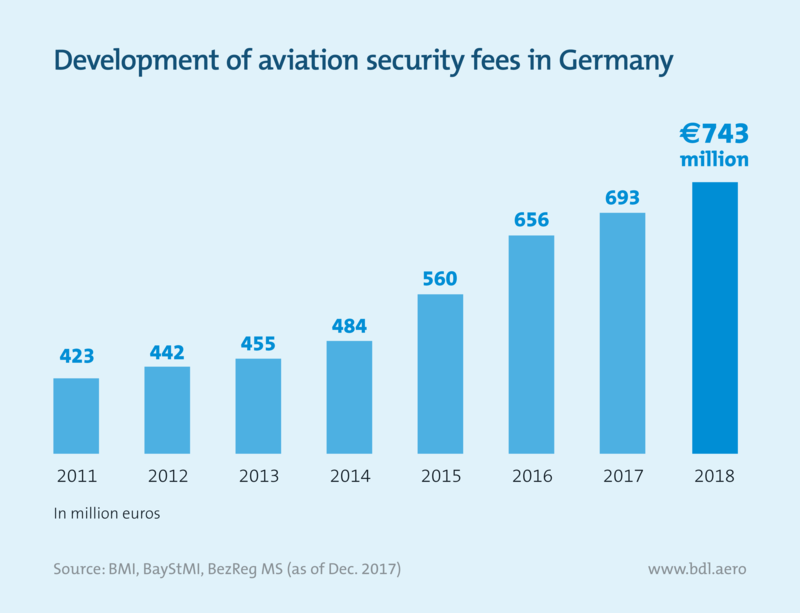 The companies of the German aviation industry therefore welcome the fact that the coalition parties have agreed to evaluate the entire aviation security system and to transfer part of the rising costs for aviation security checks to state budget financing. As the prevention of terrorism and hazards in air traffic is a social task, important competitor countries finance passenger controls and luggage inspections to a considerable extent with state funds: in the US, the state bears at least two thirds of the security costs. In many EU countries, too, the security fees to be paid by companies are capped at a low level – for example, €3.78 in Spain, €2.68 in Italy and €1.60 in Turkey. The remainder of the costs incurred are borne by the state.